From 2005 Pon de Replay to being the creative director of Fenty puma, Rihanna’s fashion taste has not been disappointing. Her fearless and innovative attitudes have long been pushing existing limits, putting herself under social media’s spotlight with outrageous outfits for countless times, such as CFDA Awards 2014’s Adam Selman sheer Swarovski gown, 2015 GMA head-to-toe pink outfit, Met Gala’s Guo Pei and Comme des Garçon. Taking credits, Mel Ottenberg and Jahleel Weaver as Rihanna’s styling team worth tons of mentions. Rhode Island School of Design graduate Mel Ottenberg has been working with Rihanna together for 6 years since 2011’s Loud Tour. After meeting photographer Matthias Vriens, Ottenberg has been a stylist for thousands of shootings, including one with Rihanna for Elle in 2006. The duo came working hand in hand when reuniting after Ottenberg’s tons of collaborations with the A-list such as David LaChapelle and Britney Spears. Former Ottenberg’s styling assistant Jahleel Weaver is currently the creative director at Fenty Corp. Apart from handling collaborative projects with Puma, Dior and Manolo Blahnik, he also styles Rihanna on the side. 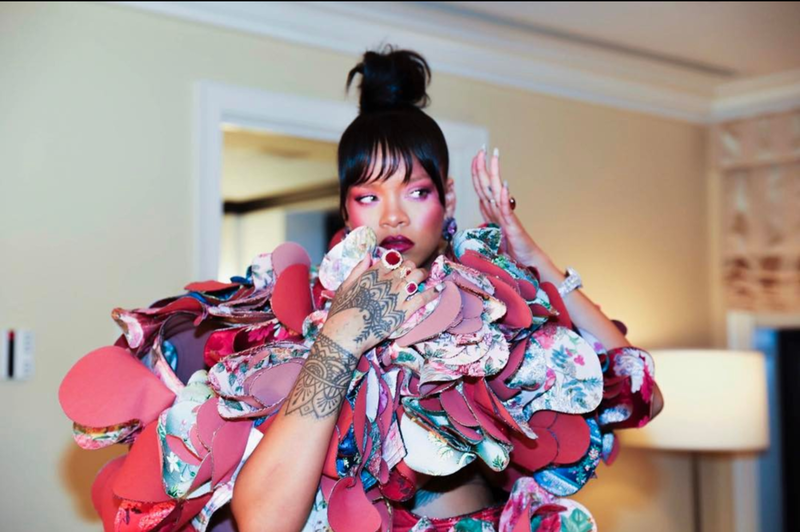 Rihanna’s bold and cannot-be-bored personalities no doubt level up the challenging styling game(They also explain her current support for students’ work), but her recent style sticks to retro. From Gucci crystal bodysuit at Coachella to Dior white gown with Andy Wolf 1999-Matrix-inspired shades at Cannes Okja Premiere, Riri has been rocking the retro glamour. True, Dior Homme’s FW17 tracksuits, Balenciaga and adidas by Raf Simons’s athletic sneakers and Gucci’s platform sneakers have proved the industry’s passion for retro elements. Perhaps channeling bad girl Riri, integrating thigh high boots, off shoulder, oversized jackets for a retro/rebellious blend is also a good option.